Bachelorette Sash - White Satin - Gold "Bride To Be"
Classy satin bachelorette sash for the Bride who wants something unique! These handmade sashes make a perfect gift that she can hold onto and cherish long after walking down the aisle. Each of our sashes are handmade in our Houston studio. 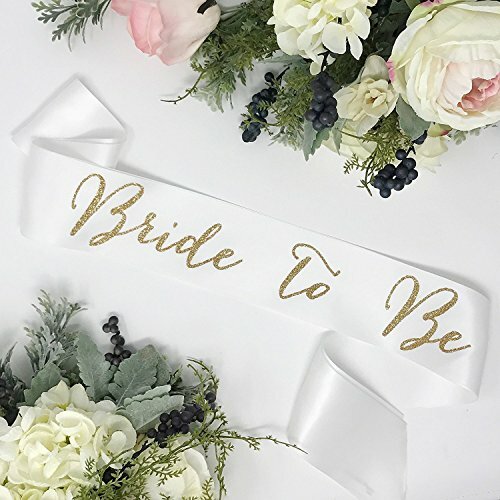 Luxurious double faced white satin make a gorgeous sash with gold "Bride To Be" in a beautiful calligraphy font. Wording it professionally heat pressed assured to last for years to come. These sashes are made extra long measuring at 72" and clasp together with a pin to keep the sash in place all night. Packaged in a delicate organza bag, ready to gift. Lace Bachelorette Sash - White Lace - Gold"Bride To Be"
Lace Bachelorette Sash - Navy Lace - White"Bride To Be"
Bachelorette Sash - Ivory Satin Sash- Gold"Bride To Be"
Mommy To Be Sash - Green Satin Sash - White "Mommy To Be"